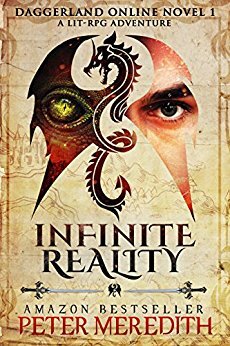 A hundred million on-line players with thousands of choices, but everyone knows there’s only one game: Infinite Reality. When a judge declares it a monopoly, the co-creators become competitors and then very quickly become murder victims with one thing in common: they were all online when they died. Everything points to the sole-surviving creator, Atticus Arching. When the FBI can’t find Arching in the real world, they send Agent Daniel Roan and his team to the “other side” to track him down, only to find out that the game is more than just a game and Arching is more than just a computer programmer. He’s the most dangerous person in two worlds and can kill in both. This story starts out as a Thriller/Detective story with a VR theme. Someone gets killed while wearing playing a VR game. Then when the FBI sends a cyber crime team into a full immersion VR game to catch the killer, the story turns into a more standard fantasy VR adventure romp. The story has many cute good moments. Roan, the MC, learning to trust his horse, conversations with Glitch or his team, the romance between characters (not MC and Jarrod). However, the novel suffers from unfulfilled or at least greatly delayed expectations. The setup, specifically the first 5%, is great. I’ve read a few of these openings and this is a great setup for either a LitRPG Thriller or LitRPG detective story. It’s good enough to have been an opening for an episode of Law and Order. One of the good seasons. Then things start to get a little off page. After all the justification for the FBI to send a team of cyber crime experts into the game to catch the killer and get enough evidence to charge him. There are lots of reasons why they didn’t have to, but I can sort of give leeway here because the author tries really hard to give good reasons why they have to go in the game. Then the next 60% of the novel is a combination of the FBI team being killed and having to re-roll new characters and then running around exploring the fantasy world under the loose guise of finding clues to locate the guy who can kill from the game. At the 61% mark, the FBI acts like detectives and advances the plot towards finding the killer. It just takes a really long time to get here. Hundreds of pages. Even the main character Roan, states “I think my main problem is that it feels like we’re still spinning our wheels. We aren’t any closer to catching Arching than when we first started.” That’s how I feel for most of the novel. The detective/thriller stuff I was expecting takes so long to appear it's sort of a letdown. Not to say the fantasy adventuring is bad, it's not. But it feels like it takes away from what I was expecting according to the setup. After the 63% mark, the story picks up the pace and a lot more advancement takes place. There’s still good action fantasy RPG stuff but there’s also a very clear progression of the story towards finding and stopping the bad guy. Overall, this is almost a good story. It has a great beginning but just takes too darn long to get to more detective thriller stuff.